CNNCNN anchor Brian Stelter and Kellyanne Conway. 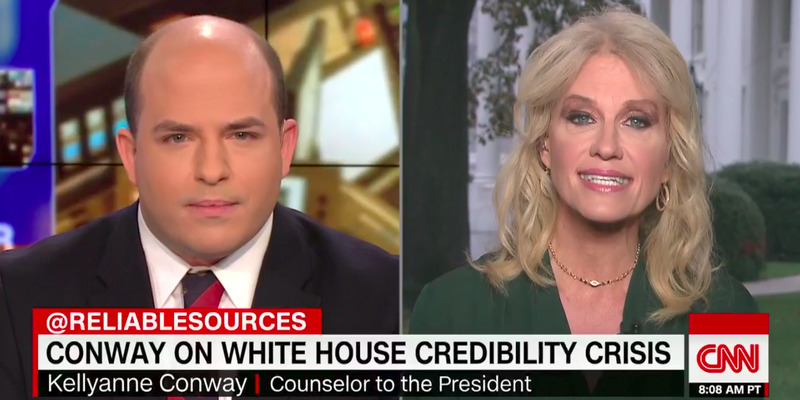 CNN’s Brian Stelter grilled White House adviser Kellyanne Conway about the AT&T merger, Russia probe, and President Donald Trump’s credibility. Conway criticised CNN’s coverage of the administration. White House counselor Kellyanne Conway clashed with CNN’s Brian Stelter in a contentious interview on Sunday about President Donald Trump’s trustworthiness and credibility. In a nearly 20-minute interview, Stelter solicited responses from Conway about the president’s low credibility numbers, approval ratings, and Trump’s reaction to the Department of Justice’s independent Russia probe. Instead, Conway repeatedly deflected his questions, criticising Democrats and CNN’s coverage of the administration. “You’re talking about CNN, instead of President Trump,” Stelter said after Conway deflected questions about Trump’s credibility by citing the strength of the stock market. She argued that CNN was writ-large opposed to Trump, and accused Stelter of being jealous of Fox News’ ratings, a common tactic used by the president’s backers to deflect from tough questions on CNN. Conway repeatedly attempted to deflect to Hillary Clinton. At multiple points, Conway cited former Democratic National Committee interim chair Donna Brazile’s new book, in which Brazile admonished the Clinton campaign for numerous perceived missteps. “I think viewers see what you’re doing: pivoting. When I say Russia, you say Clinton,” Stelter said. “It’s part of the strategy, would you agree? Hosts on some shows, including MSNBC’s “Morning Joe”, have refused to book her, citing her evasive interview style and occasional perpetuation of falsehoods. Indeed, before Sunday’s “Reliable Sources,” a number of Democrats criticised the host on Twitter for booking Conway in the first place, a decision that Stelter defended because of her important status in the White House. “I welcome everyone’s feedback about the interview — good bad & in between,” Stelter tweeted after the interview aired.